Islamists who call themselves – The Caucasus Anonymous – are threatening the Russian government and companies that support the 2014 Sochi Olympics. The Islamist group promises to “crush Russia under our feet” and to disrupt the 2014 games. Our massage is addressed to the Russian government and all Russian companies participating in Sochi games that finance even with a single dollar or any amount of money the implementation of these stupid games in our land, the land of Caucasian Genocide, in which more than 1 million people died in 1864. 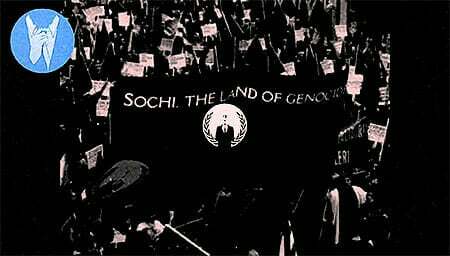 The Caucasus Anonymous believes that the Sochi games infrastructure was built on the graves of 1 million innocent Caucasians who were massacred by the Russians in 1864. Shame on Russia, shame on every Caucasian who likes these stupid games in our home land. The Caucasus Anonymous decided to carry out a new operation called Pay Back for Sochi. This is our biggest cyber-war operation against the Russian government. The Caucasians will pay back to the Russians for staging their stupid games in our land. Today, the Caucasus Anonymous is stronger than ever, and our activity will be spread worldwide. We support all Caucasus nations against our enemy country Russia and the enemies of Islam, We will force the Russian government to think 1,000 times before taking any decisions on our land. Russians, get out and leave us alone, leave, or we will crush you under our feet. Don’t think we will forget all your genocide even if the world forgets. Muslims and the Caucasus Anonymous will never forget. Our cyber war, waged against Russia, will cover all Russian government’s and companies’ websites that are part of Sochi games and anti-Islamic activities. They are all united. And our actions will always demonstrate who we are. Our latest attack against Russian banks was only a joke as compared to what is coming soon. We will kill Russia with our successful operations and bury the Russians with a smile. In a video posted online in July, the leader of the insurgency, Chechen warlord Doku Umarov, urged militants to use “maximum force” to prevent Putin staging the Olympics.